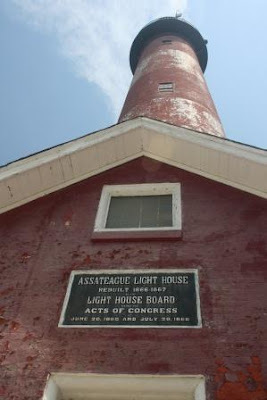 It was a rather hot afternoon when we decided to climb the Assateague Lighthouse. We'd watched it, shining its beacon across the night sky, the night before from the beach. The boys were excited to make the climb. 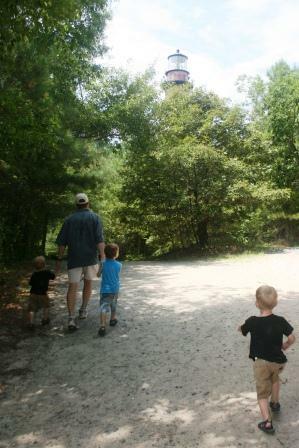 First, we had a short hike to the lighthouse. 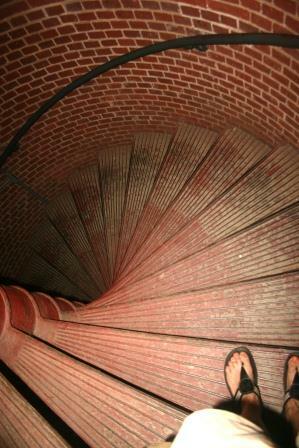 175 steps to the top. 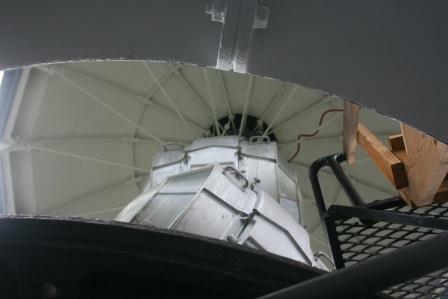 When we got to the top, my first reaction was, Whoa, it's really open up here! My second reaction was an innate desire to cling to the wall - even though I'm not really afraid of heights. You couldn't go up to the tippy-top to see the lights, but I got a peek in and took this picture. And then, it was time to head back down all those stairs. It was 85* inside the lighthouse (according to the thermometer the guy up top had) and we were all pretty sweaty! It was definitely worth the effort, though, for an adventure to the top. On a special side note, happy anniversary to my husband Paul today. We're celebrating 16 years. Hard to believe! I love this lighthouse. I've climbed to the top of a couple before but never when it was this hot/humid. You should be very proud of your boys! Happy Anniversary!! Wishing you many more. Cool that your boys made it all the way to the top ... 175 steps, very impressive. This has been a great journey with you! We usually go to the Outer Banks or Colonial Williamsburg for vacation. This really looks like a place we would enjoy. Thank you for sharing! Happy Anniversary to the two of you! Bet it's all been fun! Celebrate this special day in a memorable way. Oh how I love lighthouses,I wish I could visit every one,love this,your photo's are wonderful,wish I was there. Happy Anniversary to the both of you. May you have innumerable days of joy ahead! Theres a lighthouse at our beach too very neat! Have a great day and happy anniversary! I hope the boys are old enough to remember this day. Quite the accomplishment! Happy Anniversary!This looks like quite a climb! Wow I am impressed with your boys stamina that is quite hike they must take after Mom and Dad for sure. What a fun way to work off some of that young energy! The view looks amazing. Happy Anniversary to you!!! stopped by via FarmChick's blog. Happy Anniversary to you and your husband :-) I haven't been to Assateague yet which is embarrassing, I've lived in Williamsburg for 13 years! Don't ya love it when people wonder if your kids can handle something? People are always amazed that we take ours hiking. Cracks me up. I'm impressed that the little ones made it up all those steps. Natural born hikers! That photo looking down the steps made me dizzy . . . Happy anniversary Lisa & Paul! May you be blessed with many, many more! Loved the old lighthouse - brave boys they are! I wouldn't have doubted they could make it. :) Happy Anniversary to you and hubby! Happy anniversary! You were brave. I am afraid of heights and would feel totally unsteady, with a camera in my hands to boot! 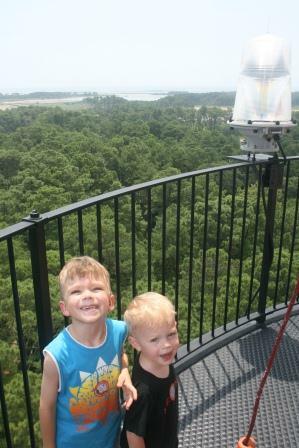 Last summer we climbed to the top of a lighthouse on the Oregon Coast. Lots of steps there too! I sure would never have doubted that your active little guys could make the climb-a piece of cake for them I bet! The guide where we were said vandals had shot out the lens at another lighthouse near by, and that the cost to replace it was going to be several million dollars! Yikes!! Way cool..light house find. Your cute little family meet an energy match. Hahaha. 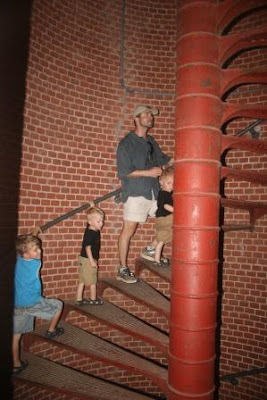 Reminds me of the steps to climb Statue of Liberty...many more I think..but very steady climb. That was the old days for me. So cool! 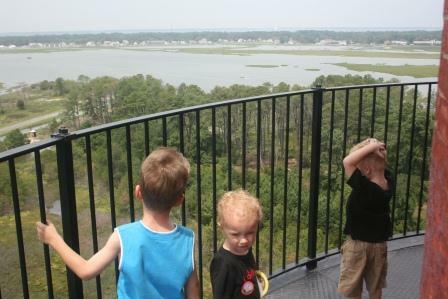 I'm glad you and the boys had a great view once you climbed to the top! That's awesome that your boys made it to the top! I agree that you just have to go all the way to the top! Glad the boys are such troopers! Happy Anniversary! That looks like a grand adventure you all had! 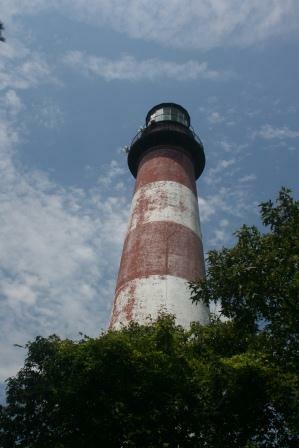 I love lighthouses! i wonder if your boys could be any cutier?? and if that view could be any better?? happy anniversary....the hubs and i just hit 34!! i guess by 34 you don't celebrate, you hit!! just kidding, of course!! What a cool climb and view! It's amazing how kids can do that without blinking--me? My knees hurt and I get freaked out by the height. what a great experience for your family. 16 years is quite a feat to enjoy! I had not doubts your boys could make it! Happy Anniversary to you & Paul. 16 years!! Congrats! That trip to the lighthouse looks great.